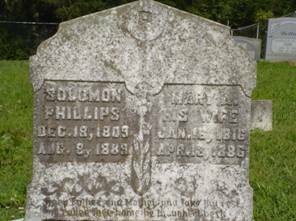 The Phillip’s Chapel Cemetery is located north of Waynesboro, Tennessee, just off Phillip’s Chapel Rd. Travel from the Courthouse Square in Waynesboro north on Tennessee Highway #13 for 5.4 miles. Turn right onto Phillip’s Chapel Rd at an old store building. The Phillip’s Chapel Community Church is approximately .2 mile off Hwy. 13. Travel approximately ½ mile to the cemetery location. 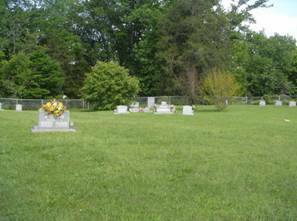 This cemetery is surrounded by private property, so please ask before going to cemetery. The cemetery is very well kept and has a chain link fence surrounding it. A few graves are entirely unmarked. 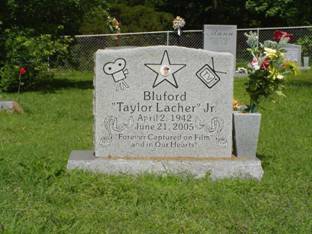 A very interesting thing about this cemetery is that Taylor Lacher, who acted in “The Dukes of Hazzard”, “The Rockford Files”, “Cade’s County” & “The “A” Team”, among numerous other movies is interred here. Our deepest grattitude to Shane Ward for guiding us to the cemetery and informing us of part of the history of it & the people buried here. Gaton, infant; b. & d. 21 Feb 1875, son of D.S. & M.A. Skelton, Dollie; b. 26 Oct 1895, d. 02 Jun 1918, son of W.G. & S.M.